In this blog we will talk about discovery of ColdFusion nodes on Performance Monitoring Toolset. 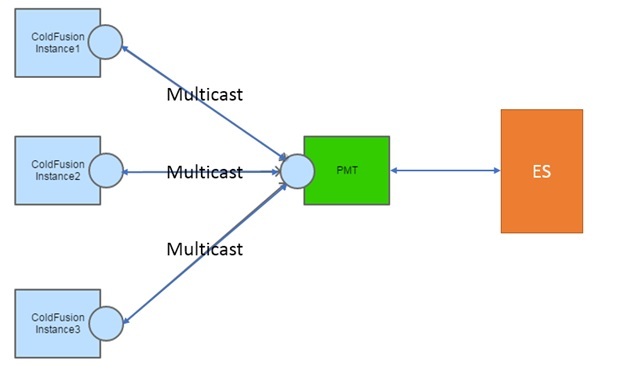 This feature will help Performance Monitoring Toolset (PMT) to discover ColdFusion nodes within the network using multicast. When you install Performance monitoring tool for the first time below screen will open after first logging in. All the ColdFusion 2018 nodes and Performance Monitoring Toolset run a multicast socket with default port 46864. When user clicks on start auto discovery button, multicast socket will be enabled on Performance Monitoring Toolset and all the ColdFusion 2018 nodes will start sending their information to Performance Monitoring Toolset over multicast. 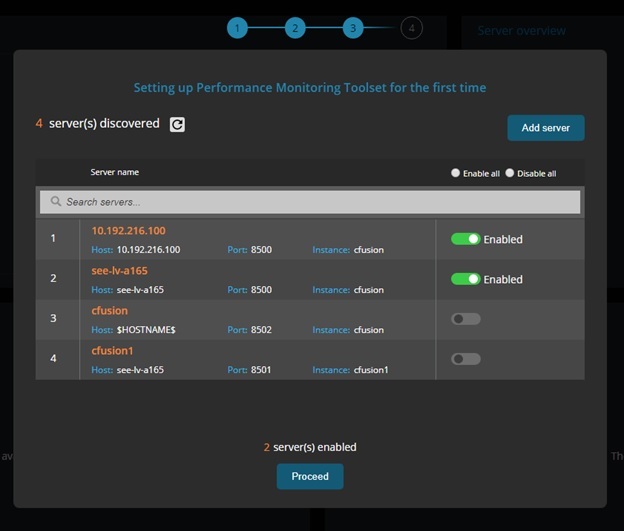 After the ColdFusion node/instance has been discovered user can decide which node he/she wants to enable for tracking in Performance Monitoring Toolset . User can click on the toggle button on the right side, to enable tracking for the node. I there are multiple ColdFusion nodes discovered user can selectively enable tracking on the nodes. If a ColdFusion node is not discovered via multicast because of network and sub-net issue, you can register and ColdFusion node manually by clicking on Add server button. On this pop up user need to fill in ColdFusion instance information. In the Server name text box add the hostname or IP of ColdFusion instance which is accessible from PMT host machine. Monitoring shared secret textbox you need to add the PMT secret generated in ColdFusion Administrator page in monitoring section. This is the secret key pair which will allow PMT to communicate with ColdFusion. If you have a J2EE deployment of ColdFusion JEE context field hast to filled with the context at which ColdFusion is running on application server. Once all this information is filled click on the Add button. These ColdFusion nodes will be added to the un-tracked list of nodes. User can select ColdFusion nodes from the list by enabling the toggle button on the right. After selection click on the proceed button. Tracking and monitoring will be enabled on individual ColdFusion nodes asynchronously. Once monitoring is enabled on ColdFusion nodes, as success message will be shown against each ColdFusion node. If any ColdFusion node monitoring was not enabled because any error like network issue between ColdFusion and PMT or ColdFusion not able to communicate with monitoring datastore, appropriate error will be shown.